This unique library brings the USA's top marching brass band to a computer near you. Sample-based cinematic construction kits currently seem to be all the rage, with a growing number of products designed to satisfy the demand for mix'n'match sounds that can be layered together to make 'production ready' soundscapes and musical effects. Sample Logic's recent Cinematic Guitars had its own unique take on the genre, being based entirely around sounds that use guitars as their source material. Cinematic Guitars also introduced Sample Logic's innovative 'core effects sequencer'; this utilises specially created KSP scripting to apply multi-layered, tempo-sync'ed modulations to Kontakt's built-in effects, giving complex rhythmical textures to the source samples. (For a detailed explanation of the core effects sequencer, a look at the Cinematic Guitars SOS review from January 2011 is recommended.) Using this same approach, Fanfare does for brass what Cinematic Guitars did for, er, guitars. However, this is not the orchestral, pop or big band brass you might expect: this is the Blue Devils, the USA's top marching brass band (see box 'The Devils' Work'). 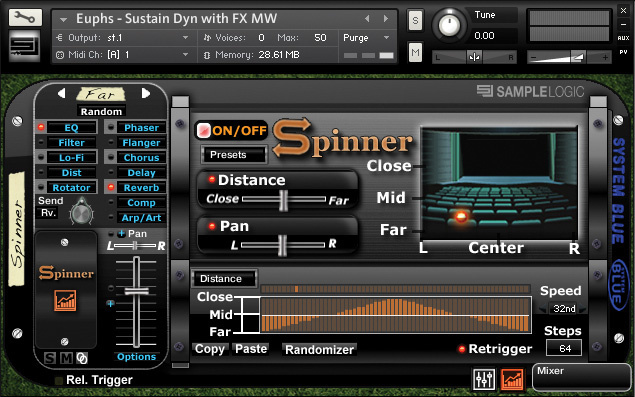 Fanfare's Spinner effect, as featured in the three-mic instruments. Distance and Pan may be modulated together, as here, or either can be modulated on its own. As with all Fanfare modulations, the mod pattern can be hand drawn in the lower step-pattern box. Distance and Pan can also have independent modulation patterns. While the layered soundscapes of the Multis and the off-the-wall synthetic treatments provided by the core effects sequencer are a prime feature of Fanfare, there is a particular emphasis on clean, naturalistic brass. After all, why go to the trouble of creating such a library if it wasn't musically useful in the traditional sense, or if it wasn't actually recognisable as brass? These 'natural' samples can be found under the Instruments main category, in the Traditional folder. This is sub-divided into Individual, Sectional and Stadium categories, the first two of which are sub-divided into instrument types. Individual (ie. solo) instruments come in Euphonium, Mellophone, Trombone, Trumpet and Tuba flavours, while Sectional (ensemble) instruments omit the Trombones. Individual and Sectional instruments are presented in a number of articulations, such as sustain, staccato, pedals, falls and sforzando-crescendo. The solo trumpets' squeeze runs, mutes, shakes and crescendi bring some high-end pizzazz to the table, matched in the Sectional trumpets by a vibrant selection of wild phrases boasting some impossibly high notes, highly reminiscent of those 'zap' and 'pow' moments from the 1960s Batman TV series. The Sectional sustains all sound lovely; the euphoniums especially are rich, warm and noble, and could almost pass for French horns. Interestingly, in drum corps music it's the Mellophones that are used as a substitute for French horns for two main reasons: their shorter tube length makes them easier to play accurately, and the bell of their horns faces forward in the marching direction, rather than sideways. 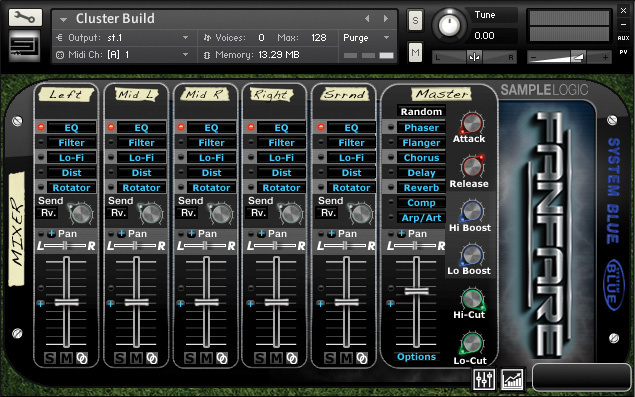 The core effects sequencer is available to all instruments, and is seen here controlling the filter's Lo-cut and Hi-cut frequencies.The ensemble trumpets are right on the money, with a sense of portent that is pure 'Also Sprach Zarathustra'. For my money, however, the star of the show is the solo sustain trumpet with vibrato and mod-wheel dynamic control. It simply oozes character without the need for any additional trickery, and sounds highly convincing playing anything from the sombre theme to Coronation Street to that Baroque-style top-line from Dynasty. Both the solo and ensemble tubas pack bottom end 'oomph', although I could have done with some fff samples, just to scare the horses. Although a token set of trombone sounds (marcatos and some rather obvious comical slides) are included in the Individual folder, as a rule drum corps use the piston-valved Euphonium as substitute for the slide trombone, which explains the lack of the latter. I can only assume this is because the trombones' long slides would be smacking people in the back of the head in close-formation displays. Even so, some Solo and Sectional trombone sustains would have been welcome additions. 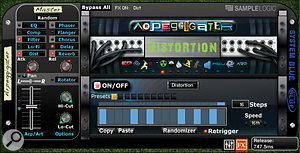 The Arpeggiator (available only to instruments in the Morphed category) is used to gate individual effects on and off. 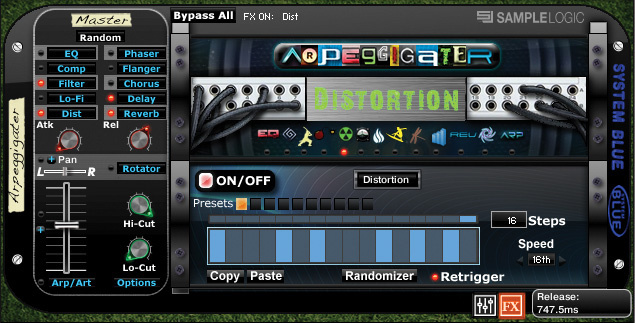 Here, it's controlling the Distortion effect. The Stadium category features the Blue Devils outdoors, performing a selection of 'tutti' ensemble effects. The Chord Collections contain a variety of looped, pre-formed chords spread across seven patches, with release samples of the stadium ambience. These include majors, suspended 4ths, open 5ths, major 7ths and major 9ths in various inversions, but, curiously, only one minor chord variation is offered (minor 7th), which tends to limit their overall usefulness. Nevertheless, the sound is regal and uplifting, lending itself to underscoring grand royal entrances. The remaining 12 patches are given over to clusters, pedals, swipes and other forms of orchestrated mayhem that are a speciality of the Blue Devils' performances. Given the unique sonic character of the Stadium recordings, it would have been good to see a little more variety and content in this category — some playable instruments, for example. Fanfare's Multis Cover four categories; Construction Beds, Instrument Stacks, One Note Glory and Traditional. Construction Beds have several instruments (often atonal or rhythmical) laid out across different areas of the keyboard, allowing the creation of custom soundscapes by bringing each one in and out as you wish. Instrument Stacks comprise multiple instruments all occupying the same key range, showcasing a selection of traditional brass stacks and synthetic, morphed and arpeggiated stylings. One Note Glory means exactly that: evolving textures, often with a rhythmical element, best played on one note, and ideal as tension builders. Traditional Multis make use of only the natural brass samples, with instruments organised into 'orchestrated' groups. These are a bit of a curiosity — useful as spot effects, perhaps, but not especially for creating a realistic brass arrangement, as all the instruments are effectively tied together and can only move in strict unison. This composite screenshot shows the two modes of Fanfare's note arpeggiator. 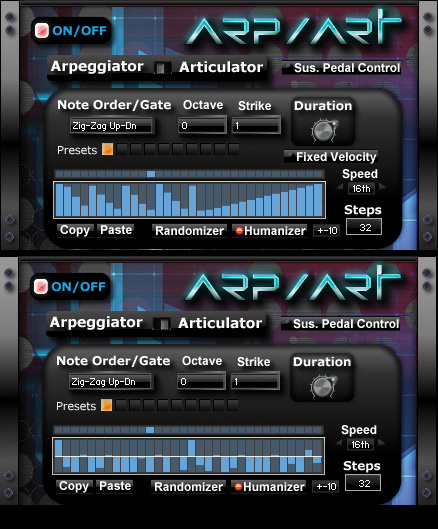 In Arpeggiator mode, each step acts as both a note trigger and a velocity value for that note. In Articulator mode, the arpeggio runs continuously, with each step controlling just the velocity value for each note. 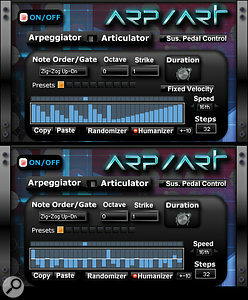 All arpeggio and effects sequencers have 10 preset locations for step patterns, each of which can be custom drawn, as were these examples. 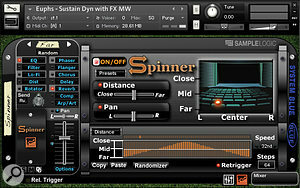 Individual and Sectional instruments were recorded indoors with close, 'mid' and far mics, and the main mixer page of the user interface provides control over the level and panning of each mic, as well as effects assignments and send levels. The on/off status and send levels for each mic's effects can be linked to work globally, or unlinked for individual treatment of each mic. These multi-mic instruments also have access to Fanfare's Spinner effect, intended to simulate rotational movement in space by simultaneously modulating the three mics' pan positions and levels. Front to back movement is achieved by modulating the mic-channel levels in sequence, to create a 'Mexican wave' effect. The Stadium samples were recorded using surround-sound recording techniques, utilising five mics (left, mid left, mid right, right and surround), and in this configuration the Spinner effect only modulates pan position. The Morphed category is where Fanfare abandons all pretence of realism and enters the world of sound design. These sounds are sub-categorised into Atmospheres, Impacts and Instrumentals, with further sub-categories indicating function or mood. Instrumentals use the 'straight' brass samples as their source material, making use of Kontakt's effects, arpeggiators and the core effects sequencer to give a synthetic edge. Impacts comprise one-shot samples that specialise in those shock 'gotcha' moments, as well as arpeggiated rhythmic patterns. By far the most intriguing aspect of the Morphed category are the Atmospheres — a collection of Ambiences and Stingers that are quite often far removed from their brass origins, or, indeed, real-world sounds in general. 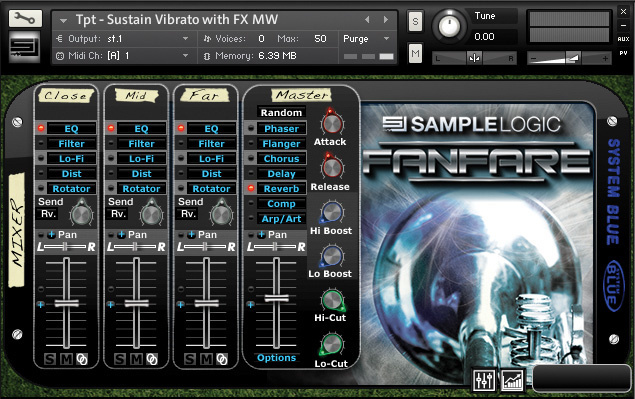 Many of the samples are the result of extensive processing, warping and experimentation by Fanfare's creators, Joe Trupiano and Keith Robinson, while others demonstrate just how thoroughly the core effects sequencer is able to disguise the natural character of the original brass. If you're into modern pop production and cutting edge sounds for games and movie scoring, then, this category offers a great deal of inspirational material. 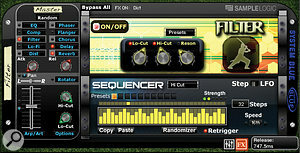 Fanfare also introduces another tool to the core effects sequencer: the Arpeggiator, available only to sounds in the Morphed category. 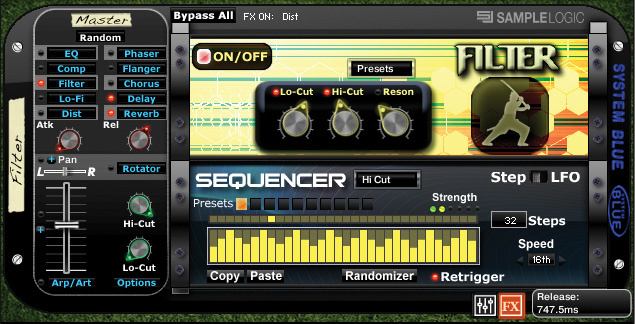 This affords each Kontakt effect its own step sequencer, but rather than modulating the effect parameters in the usual core effect sequencer manner, it modulates the effects' on/off status, basically 'gating' them on and off in rhythmic patterns. 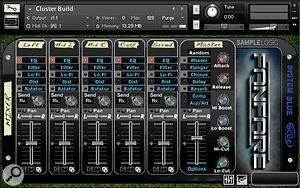 The default mixer screen for 5-mic instruments from the Stadium category. Fanfare can be said to be the best marching brass sample library out there, not least because there doesn't appear to be anything else quite the same that could compete with it. It's also a further demonstration of how the Kontakt engine can be manipulated to make any sound unrecognisable, but still musically useful and inspirational. Sample Logic clearly intend Fanfare to appeal not only to composers and arrangers in the traditional mould, but also to educators, pop musicians, experimentalists or anyone who simply wants the power of the Blue Devils at their fingertips. 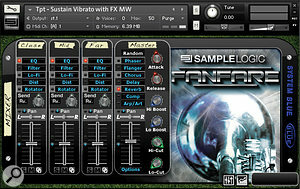 There is one caveat to bear in mind: unlike Hollywood-style orchestral libraries, Fanfare does not incorporate luxuries such as true legato, glissandi, slurs, trills or other tricks to simulate real performance techniques. If that level of realism is required, you'll have to compromise on the sound and look elsewhere. Nevertheless, there's plenty of scope within the Traditional categories to construct some impressive-sounding brass parts using the unique qualities of the Blue Devils sound, so Fanfare should prove a valuable aid to brass arrangers wanting to road-test their arrangements before they hand over the scores to the band. As for the core effects sequencer treatments and morphed textures, there's a wealth of fascinating material here to add spice, atmosphere and interest to any modern production, whether it's a pop song, a high-end PC game or a blockbuster movie score. If we were talking alternative orchestral, jazz or big-band brass libraries, there would be a number of options. However, after conducting an intensive search for alternative marching brass libraries, I could find nothing. If there is anything out there at all, it's keeping well hidden, which suggests that Fanfare is currently unique in being dedicated to samples of a top American marching brass band, with the added benefit of combining them with Sample Logic's core effects sequencer. Ask most people here in the UK what brass bands bring to mind, and their answers will probably include the Salvation Army, colliery bands, the band of the Royal Scots Guards and Monty Python's Flying Circus. Although we have a fine tradition of brass bands in the UK, with competitions to honour the best, the Americans take the concept — and the competitive spirit — to a whole new level, so much so that to join a top US marching band is akin to enrolling in a military academy, demanding rigid discipline, dedication, and a musical virtuosity that would even have made members of Frank Zappa's band tremble in terror. Not only do members have to be complete masters of their instruments, they also have to perform complex and geometrically precise formation marching routines, while simultaneously delivering faultless cadenzas of hemidemisemi quavers. The DCI World-Champion Blue Devils represent the pinnacle of this discipline, and it was the Blue Devils' 2010 Brassline that Sample Logic recruited to supply the samples for Fanfare. For further information on the Blue Devils, visit www.bluedevils.org. The indoor samples for Fanfare were recorded by Leslie Ann Jones on The Scoring Stage at Skywalker Sound and the outdoor performances were captured on the field at Ralph Wilson Stadium (home of the Buffalo Bills football team), by Grammy award winner Frank Dorritie. The arrangements were by John Meehan, Brass 'Caption Head' for the Blue Devils. Constructing a multi-articulated brass arrangement in Fanfare can become time‑consuming and unwieldy, since the 'traditional' instrument articulations exist only as separate patches, with no means of changing articulations on the fly via keyswitches. What's needed is some way to compile a keyswitchable collection of articulations: fortunately, a company called Orange Tree Samples has the solution in the form of a Kontakt Multi-script called Mind Control. Mind Control is a layer-based mapping engine used in conjunction with Kontakt Instrument Banks. Simply load the Mind Control Multi-script, then load all the required articulations into the separate instrument slots of an Instrument Bank, and define a set of conditions (for example, keyswitches) to switch between them. Simple, efficient, and rather good. There's more info at www.orangetreesamples.com. PC: Windows XP (SP2, 32-bit)/Vista (32/64 Bit), Windows 7 (32/64 Bit), Pentium or Athlon XP 1.4GHz, 1GB RAM. Mac: Mac OS 10.5 or higher, Intel Core Duo 1.66GHz, 1GB RAM. Pristine recordings of the Blue Devils' famous wall of sound. The Morphed instrument category offers immense scope for creativity. Some users may feel the need for more sophisticated 'realism' performance tools for the traditional instruments. In addition to placing a strong emphasis on traditional brass, Fanfare delves deeply into the world of sound design and cutting-edge synthetic treatments. Its versatility makes it suitable for a wide range of applications, from games and movie scores to modern pop productions, and, of course, offers marching-band arrangers the opportunity to mock up their scores with the sound of a real marching brass ensemble. Although Fanfare lacks the sophistications of some heftier orchestral brass libraries, it's the sound that makes it special, and currently unique.